Law Against Discrimination also requires employers to make “reasonable accommodations” so that employees can do their jobs despite their disabilities. New Jersey’s Workers Compensation Act requires employers to carry workers compensation insurance which provides for medical coverage and compensation for employees who are injured on the job. However, there are relatively few cases examining the interplay of these two important New Jersey employment laws. However, New Jersey’s Supreme Court recently issued an important decision on just this interplay in the case of Caraballo v. City of Jersey City Police Department. New Jersey’s Law Against Discrimination prohibits discrimination because of disability. 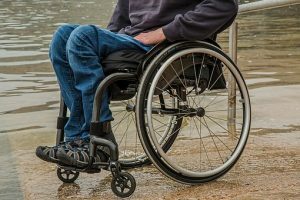 While the LAD does not expressly state that employers are required to accommodate employees’ disabilities, New Jersey’s courts have routinely read this requirement into the law, just as is expressly required by the Federal American’s with Disabilities Act. (known as the “ADA”). Under these employment laws an employer which becomes aware that its employee has a disability are legally required to engage in an “interactive process” to determine what reasonable accommodations they can provide to allow the employee to fulfill the duties of her job. If a reasonable accommodation which would allow the employee to do her job is possible, the employer must. Frank Caraballo was a Jersey City police officer. He was involved in an auto accident in 1999 in which he sustained severe injuries to his knees. In 2001, he filed a workers compensation claim. Two city appointed doctors agreed that he would eventually need total knee replacements to fully recover, and two other doctors concurred. In 2006, Caraballo’s attorney requested that Jersey City authorize the knee replacement surgeries. In 2008, the attorney wrote back requesting a particular surgeon to perform the operation. Apparently there was no response from the City. In late 2010, Caraballo submitted an application for retirement. At approximately the same time the Commander of the Department’s Medical Bureau followed up with Caraballo and his doctors. Based on these conversations and a review of Caraballo’s file, the Commander determined that he “had been unfit for duty for numerous years,” and that Caraballo was apparently not pursuing the knee replacement surgery. The Commander alleged that Caraballo refused to see a doctor designated by the City to confirm whether Caraballo could have the knee replacements. Shortly thereafter, the Chief of the Jersey City Police Department met with Caraballo. He advised him that because he had not had the knee replacement surgery if he did not follow through with his retirement package and retire on March 1, the Department would apply for an involuntary disability pension on his behalf. Caraballo retired on March 1. Thereafter, a workers compensation doctor examined Caraballo and told him to contact his office to pick a date for surgery. Caraballo did not call the office to schedule the surgery. In 2013, Caraballo settled his workers compensation claim, more than six and one half years after he requested authorization for the knee replacement surgery. He also filed a suit against the Jersey City Police Department for disability discrimination under the Law Against Discrimination. After full discovery of evidence, the trial judge in the Law Division of New Jersey’s Superior Court ruled both that surgery was not a “reasonable accommodation” for a disability, and also that by not appealing the failure to authorize the surgery in his worker’s compensation case he had waived the right to bring a lawsuit for disability discrimination. Caraballo appealed the decision to the Appellate Division of the Superior Court, which reversed the trial judge and remanded the case for trial. Jersey City then appealed to the Supreme Court of New Jersey. The Supreme Court agreed with the trial judge’s dismissal of Caraballo’s suit and reversed the Appellate Division’s decision. The Supreme Court agreed with the two grounds upon which the trial judge relied to dismiss Caraballo’s complaint. First, the Supreme Court held that because Caraballo did not utilize the enforcement procedures provided in the Workers Compensation Act, he could not sue for disability discrimination. The Court explained that in 2008, the Act was amended to provide a wide range of enforcement mechanisms for injured workers to enforce orders of the Workers Compensation Court. Failing to utilize these procedures, he was precluded from bringing a “failure-to-accommodate” claim under the New Jersey Law Against Discrimination. Second, the Court explained that while the Law Against Discrimination requires employers to provide reasonable accommodations (if available) to allow disabled employees to do their job, surgery is not a reasonable accommodation. Reasonable accommodations are those which are designed to make “changes in the work environment or structuring of employees’ time that will allow disabled employees to remain at work without their [disabilities] impeding their job performance.” Medical treatment is not a change in the work environment, and thus not an accommodation. While an employer must give an employee reasonable time off for medical treatment, it does not have a duty to provide or monitor that treatment itself. Employees who are injured on the job should utilize all of the appeal and enforcement provisions of the Workers Compensation Act – which contains its own anti-retaliation provision prior to filing suit under the New Jersey Law Against Discrimination. Employers should not delay in responding to requests for medical authorizations – the Workers Compensation Act has severe penalties and enforcement provisions, and the employer here was lucky that the employee did not utilize them. Once an employer learns that its employee has a serious medical or psychological condition it must engage in an interactive process to determine if it can provide a reasonable accommodation so that the employee can perform her job despite her disability. If such a reasonable accommodation is available, the employer must provide it. Our employment attorneys represent employers and employees in all aspects of New Jersey employment law, including claims of disability discrimination and failure to accommodate.